1. Peel the sweet potatoes and cut them into approximately 1/2 inch cubes. Cut the green tops and stem ends from the leeks (save the green tops for flavoring stocks), quarter stalks lengthwise, and cut them into 1/2 inch pieces. 2. Heat the milk, stock, and water in a soup pot or large saucepan. Add the sweet potatoes, leeks, celery, pepper, and allspice. Bring just to a boil, reduce heat, cover, and simmer for 15 minutes or until sweet potatoes are just tender. 3. Make a rue by mixing melted butter and flour in a small sauce pan (over low heat) until pasty. Ladle in a half cup of the soup (liquid only).Stir until mixture is smooth. Add to the soup and let it cook for a minute until thickened, stirring very well. 4. Remove the pot from the heat, stir in chopped chicken and serve. Note: If the sweet potato peels are relatively unblemished, you can make them into a garnish for your soup by cutting them into thin strips and frying them in about 1/4 inch of hot oil until lightly browned. Drain on paper towels and toss with a little salt. We have some extra help harvesting our peppers this week. 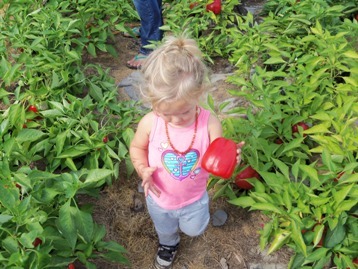 Rachael and her daughter are working to gather peppers, and other veggies for a new product line. We are starting to expand the use of our certified kitchen, to include frozen veggie blends, for soups and stir-fries. Dale, from White Pine Farm, and his group volunteers, are busy planting for the late fall and winter harvest. The up and coming winter produce is getting a good start on its growth while the weather is still warm. The beauty of hoop house season extension really shines this time of year. Planting and harvesting beets, carrots, spinach, kale, and other greens well into the season! These beds are sometimes covered with mulch to ensure it stays protected from the winter weather. Almar Orchards is proud to present a beautiful selection of seasonal apples. This week they will be offering a variety of freshly picked organic flavors. Including the one you have all been waiting for, the Honey Crisp. Its sweetness, firmness, and mild tartness make it an ideal apple for eating raw! 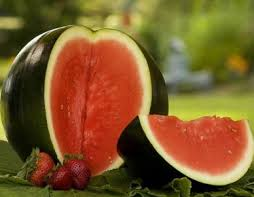 It has much larger cells than most apples, which BURST when bitten to fill the mouth with juice. The Honey Crisp also retains its colors well and boasts a relatively long shelf life when stored in cool, dry conditions. Other featured apples this week include the Gala, Paula Red, Nova Mac and McIntosh.Some of the varieties are available in large quantities for canning, baking and dehydrating ..or just eating like crazy! Wait and watch the weather, will we have frost, will the soil temperatures get too cold, is the season long enough to give us big potatoes (and some small ones)? 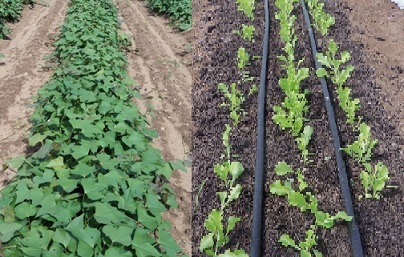 Dale, from White Pine Farm, has already begun to dig the sweet potatoes…and they are looking good! After the sweet potatoes are harvested another two weeks of cure time is needed. This helps to toughen and dry out the skins so that they will last longer in storage. Rest assured, they will be worth the wait. FRESH CIDER is finally here. One of the moments we have been waiting for. The cider press has been fixed and fresh cider should be available from now until early spring. You can stock up and freeze the cider. Heat a little of it to warm yourself on the cool nights. If it is in the refrigerator for too long and gets fizzy it is rather tasty, although if you do not like the fizz just freshen it by warming it on the stove. Almar Orchard has won awards in the past for their cider. They like to mix a variety of apples that include tart and sweet to acquire excellent flavor. Into the year as the apple changes the flavor slightly changes. Sweet Potatoes to the left, waiting to be dug out of the ground, they are in the morning glory family so the tops vine out. It is important to give them the longest possible growing season and still yet not let them get hit by frost so on a daily basis we watch the weather report and when it looks like we will have a frost we remove the tops and dig for these delicious potatoes. 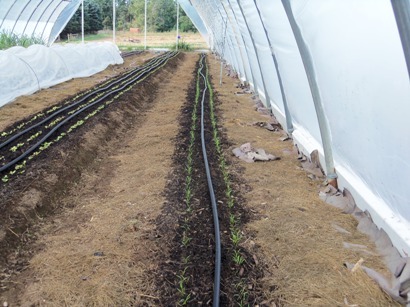 Lettuce is to the right, that was recently planted in a hoop house and the lettuce can tolerate cooler temperatures. In several weeks we hope for some fresh lettuce, which will be a relief since this fresh lettuce tastes so much better than lettuce bought in the store. Winter Squash Harvest Time, Law Family Farm is harvesting their winter squash. Koleine Law says it has been a totally uneventful year for growing. They did not have to battle squash bug, powdery mildew, squash vine borers or cucumber beetles. 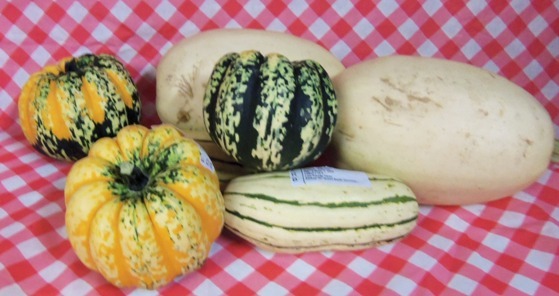 They will be having a total of five varieties this week on the website, butternut, delicata, spaghetti, carnival and buttercup. The picture above is some squash that was sold this week. 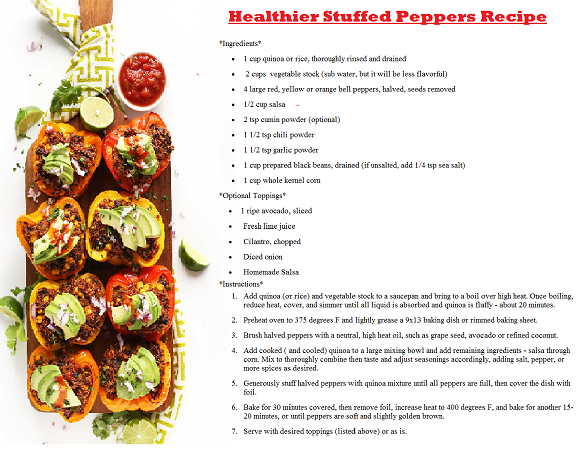 Tasty Yummy Winter Squash, cooked in the oven is the perfect thing to have to warm you up as the weather cools down. APPLES FOR THIS WEEK. Almar’s are now picking Ginger Gold apples and they have a lot of Paula Red apples available. Fresh cider should be coming soon, the only hiccup is that the cider press is not working properly. As soon as they expert repairmen arrives they will be pressing fresh cider again. They have won awards in the past for their cider. They like to mix a variety of apples that include tart and sweet to acquire excellent flavor. Into the year as the apple changes the flavor slightly changes. 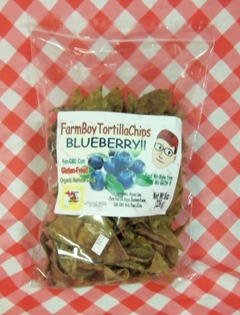 John Simmons from Farm-boy Flapjacks has introduced a new flavor of chips made to his specifications from his very own open pollinated certified organic corn that he grew. The chips are in a seal-able zip lock back. To top it all off he offers a money back guarantee on any bag that is stale. Which is pretty phenomenal considering the high humidity we have in this state. Remember they do not contain any preservatives. How cool is that. NEW APPLES THIS WEEK. Almars are now picking Ginger Gold apples and they have a lot of Paula Red apples available. Next week they will be picking Machintosh Apples. Almar grades their apples into two grades #1, which is close to being blemish free and #2’s which have more blemishes (these are also called weather kissed), these apples are not bruised. The apples are hand picked and the ones that don’t make either grade are than turned into a wonderful blend of cider. When making the cider they use more than one variety of apples in combinations that make wonderfully flavored cider. 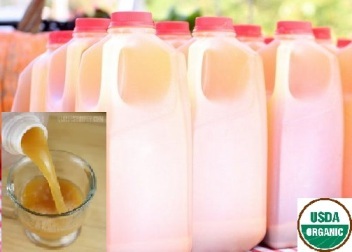 To add other products to the mix they make switchel, apple cider vinegar and hard cider. When the fall season is in full swing they start making apple cider donuts. 1. 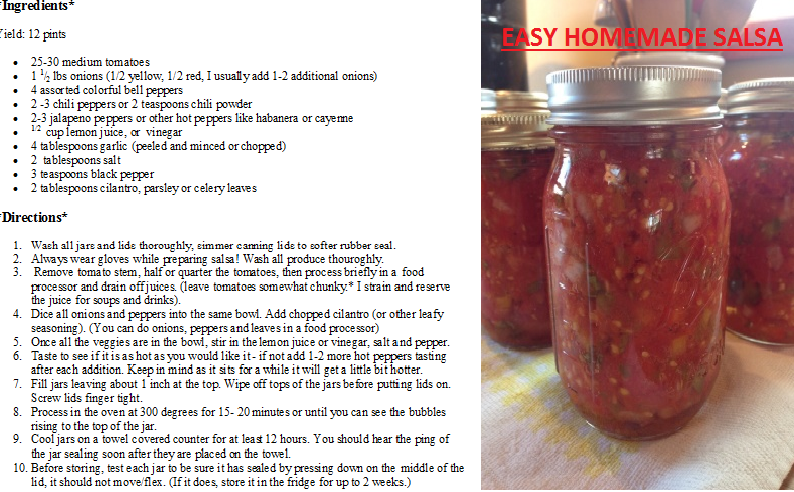 Tomatoes: Combine all ingredients in a medium bowl. 2. Herbed yogurt: Blend all ingredients in a food processor until mixture turns pale green. Scrape into a small bowl. 3. Lamb: Combine in a large bowl until blended. Set a large, heavy skillet over medium-high heat until hot. Add oil and swirl to coat skillet. Add lamb mixture and cook, stirring frequently to break it up, until browned, about 10 minutes. Pour off fat. 4. 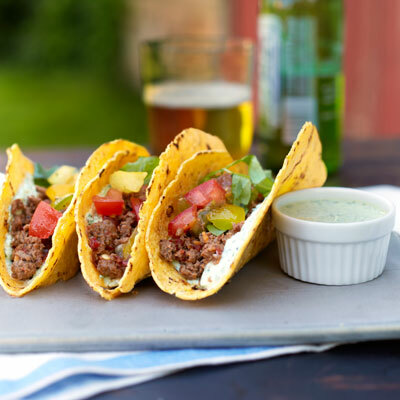 Spread tortillas with herbed yogurt and top with lamb, tomatoes, and lettuce. HOT HUMMID WEATHER. It has got to be good for something, not sure what. The farmers wish they could escape the heat, but they cannot. The gardens and livestock must be tended to and cannot be ignored, especially during these weather conditions. Dale (White Pine Farm) said the celery seems like the heat and humidity, on the downside is that diseases like fursium wilt also thrives, this disease damages celery and other crops. Each year among some of the crops that don’t do well the farmers often experience pleasant surprises. 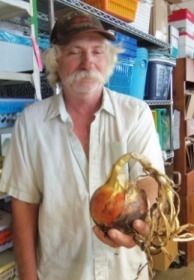 The above picture is Dale from White Pine Farm holding a copra onion, which are a good storage onion, prior to hand harvesting the onions, he was worried they might be going bad since he could not get to them timely due to the fact that there is too much to do that needs to be done all at once. To his pleasant surprise this year has been one of his better copra onion crops.